once during your turn (before your attack), you may look at the top 2 cards of your deck, choose 1 of them, and put it into your hand, put the other card on the bottom of your deck. this power can't be used if Uxie is affected by a special condition. 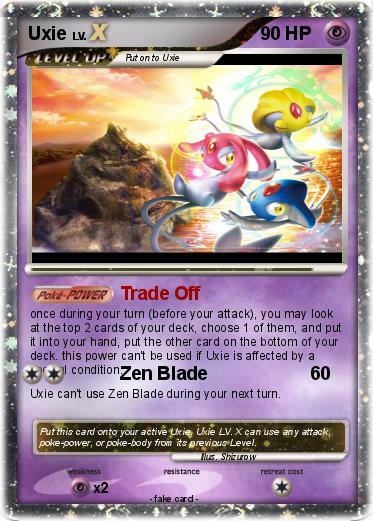 Uxie can't use Zen Blade during your next turn. Comments : Put this card onto your active Uxie. Uxie LV. X can use any attack, poke-power, or poke-body from its previous Level.